Minot State University students selected Logan Gunderson and Keyona Walker as the 2016 Homecoming King and Queen Sept. 13. Gunderson, an accounting and finance major, represented Student Government Association. Walker majors in early childhood education, and she represented MSU Life. Pictured, left to right, are Christopher Stokke, Fargo; Jennifer Hayes, Camana Island, Wash.; Shannon Guinn, Wasilla, Alaska; Casey Feldner, Burlington; Cassandra Stauffer, Minot; Hannah Harvey, Minot; Stephanie Sundhagen, Tioga; Keyona Walker, Minot; Logan Gunderson, Berthold; Jeremy Toles, Phillsburg, N.J.; Laurence Sibley, Glendora, Calif.; Miranda Lessmeister, Lake Lenore, Saskatchewan; Morgan Matejcek, Brocket; Christina Beck, Saskatoon, Saskatchewan; Annika Kraft, Minot; Kjerstie Fevold, Velva; Zachary Cunha, Rocklin, Calif.
For questions, contact Aaron Hughes, student activities coordinator, at aaron.hughes@minotstateu.edu. To read the full news release, go to http://www.MinotStateU.edu/pio/news/2016/09/msu-homecoming-king-and-queen-named.shtml. David Gowan, Walter Piehl Jr., and Tom Probst will receive the Minot State University Alumni Association’s Golden Award Thursday evening (Sept. 15) in the Conference Center, 6 p.m. DelRae (Zimmerman) and Matthew Geinert will receive the Young Alumni Achievement Award. Gowan, entrepreneur, attended Minot State University from 1975 to 1979. He completed a bachelor’s degree in business management with concentrations in economics, data processing and money and banking. He also played football as a running back with all-conference recognition. After graduating from MSU, the Des Lacs native started his own business, Gowan Rain Gutters, Inc. He has also been successfully involved in real estate since 1979. His wife, Dolly (Kavlie), attended Minot State from 1974 to 1975 and then completed the MSU-Trinity Hospital nursing program as a registered nurse. She is employed in the Radiology-Oncology Department at Trinity Medical Center. The couple live in Minot and have two daughters. Michelle is a licensed practical nurse in Bismarck, and Cheri is a dental hygienist in Minot. Piehl, North Dakota visual artist and Minot State University art professor, describes his art as expressionistic Western Americana, but with a modern, contemporary influence. Piehl was raised near Marion, N.D. After graduating from Marion High School, he left the farm to study art at Concordia College, Moorhead, Minn. He graduated in 1964 with an art major and teaching certificate. He then enrolled in graduate school at the University of North Dakota and received a Master of Arts in painting and drawing two years later. Early in his career, Piehl taught in Dickinson, Valley City, Ellendale and Mayville. In 1969, he entered the University of Minnesota Fine Art Department to pursue an MFA. Fall semester 1970, he began teaching drawing, painting and art education methods at MSU. Piehl has exhibited his work regionally, nationally and internationally. His paintings have been included in many collections including the Smithsonian Institution’s Center for Folklife and Cultural Heritage in Washington, D.C., the Phillbrook Museum of Art and the Northwest Museum of Art, Buffalo Bill Historical Center, Cody, Wyo., and C.M. Russell Museum, Great Falls, Mont. A major retrospective of his work was organized by the Plains Art Museum in Fargo in 2003. His exhibition record and workshop presentations are extensive and exemplary. He was the featured artist in the offices of North Dakota Gov. John Hoeven and first lady Mikey Hoeven, and he received the Governor’s Art Award. His artwork currently hangs in the office of Sen. Heidi Heitkamp. Prairie Public Television created two documentaries about him: “North Dakota Artist: Walter Piehl” in 1971 and “Walter Piehl: Sweetheart of the Rodeo” in 2011. Among his many honors and awards are a North Dakota Council on the Arts Fellowship in 2005 and the 2008 Enduring Visions Award for his creativity, connection to community and impressive body of work from the Bush Foundation, a private foundation serving Minnesota, North Dakota and South Dakota. Piehl was one of three people selected for the prestigious $100,000 award and described it as the highlight of his art career. Piehl and Becky, his wife, have been married for 52 years. They have four children, Shadd, Levi, Crystal and Dahcota. Probst, entrepreneur, has lived in Minot nearly all his life. After earning a bachelor's degree in business administration from Minot State University in 1967, Probst also completed the Dale Carnegie Program. Starting at age 15 at his father's Dakota Beverage Company in Minot, he had a 50-year career in the beverage-distribution business. He later launched his own operation, Premium Beverages, with the purchase of Capital Distributing Company in Bismarck and developed an area from Williston to Devils Lake and Jamestown. After selling the business, he became an investor and apartment developer. "I started out as a janitor and ended up as president," Probst said. Probst and Mary, his wife, share his parents' belief in education. "You can lose everything, but education is something that can't be taken away from you,” Probst related. “Statistics prove that people with a university, college or trade school education excel and earn a higher income throughout life." Both Tom and Mary administer individual family farms in Burke County and have a long history of leadership and volunteer service. They are both past presidents of their church council. Tom has served as president of the Magic City Toastmasters and is a recipient of the Distinguished Toastmaster Award, the international organization’s highest honor. He is past president of the Minot Lions Club and Jaycees, past chair of the Salvation Army board of directors and past vice chair of the Trinity Health Foundation, through which he helped develop the guest house for families of ICU patients. He is currently chair of the Minot Area Community Foundation board of directors and vice chair of the MSU Development Foundation Executive Committee. He also serves on Bread of Life Lutheran Church’s council as stewardship chair. Probst and his stepdaughters, Lynette, a Bismarck State College professor, and Denise, Gourmet Chef owner, are proud to be Minot State University graduates. The couple share two other children, Mike and Steve, and three grandchildren, Steven, Jayde and Payten. They established the Tom and Mary Probst Scholarship Endowment at MSU in 2000. DelRae (Zimmerman) Geinert, president and one of the broker/owners of Brokers 12 Real Estate, was raised in the Richardton-Taylor area. She graduated from Minot State University with bachelor’s degrees in accounting and finance in 2004. Matthew Geinert, vice president of Future Builders, is a Minot native. He enrolled at Minot State to pursue a bachelor’s degree in history education and continue his hockey career, playing four years for the Beavers. During college, he bought into Future Builders Inc, working summers for them, and he started working full time the day after he graduated from Minot State. While Matt and DelRae both delved away from their respective degrees, they credit Minot State with providing a learning environment, resources, and most importantly, the faculty and staff to challenge them to be who they are today. They have combined their similar career knowledge and driven personalities into many business ventures. Their holding company, GG Ventures Inc., maintains control of 17 different entities, most notably in real estate holdings, construction companies and cattle enterprises. Married since November 2012, the couple is involved with charities and the community. Matt currently serves on the City of Minot Planning Commission and Woodside Townhome Association and Bishop Ryan Alumni boards. Within the Minot Board of Realtors, DelRae has been engaged with many organizations, such as the Salvation Army, Souris Valley United Way, Minot Backpack Buddies and Minot Association of Builders. They and their two daughters, Ivy (3) and Violet (2), attend Our Lady of Grace Catholic Church. For questions, contact Janna McKechnie, director of alumni relations and annual giving, at 858-3373 or janna.mckechnie@minotstateu.edu. To discuss the current budget situation, including a review of steps taken to address this year’s two allotment reductions as well as the mandated 90 percent budget for the ’17-’19 biennium, campus forums are scheduled. The forums will be in Aleshire Theater on Wednesday (Sept. 14) at 2 p.m. and Thursday (Sept. 15) at 8 a.m. The sessions are interchangeable. Students, faculty and staff are encouraged to attend one of the forums. For questions, contact 858-3300 or deb.wentz@minotstateu.edu. Minot State University continues its tradition of excellence with its 88th Homecoming, which centers on the theme of “Wild with Beaver Pride.” Homecoming Week officially kicked off Sept. 13 and runs through Saturday (Sept. 17). 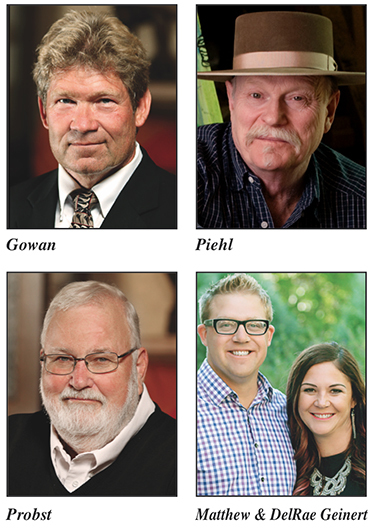 Highlights include the Golden Award Banquet Thursday (Sept. 15) in the Conference Center at 6 p.m. David Gowan, Walter Piehl Jr. and Tom Probst are the 2016 Golden Award recipients, while Matt and DelRae (Zimmerman) Geinert will receive the Young Alumni Achievement Award. Friday (Sept. 16), the Homecoming Alumni Reunion, open to all MSU alumni and friends of the university, will convene at the Sleep Inn, 7 p.m. Special reunion groups include members of Student Government Association, residence life, and volleyball and softball teams. Saturday (Sept. 17), Homecoming reaches its apex with the Homecoming Parade at noon. A tailgate party will follow in front of the Dome on 11th Avenue. The MSU Beavers face off against the University of Sioux Falls in football at Herb Parker Stadium, 3 p.m. The Northern Lights International Film Series begins Monday (Sept. 19) in Aleshire Theater with the 1994 Italian/Spanish film, "Il Postino." In Michael Radford's film, an Italian postman learns to love poetry while delivering mail to a famous poet; he uses this to woo a local beauty. A social begins at 6 p.m., with the screening at 6:30 p.m. There will be a door prize drawing for a gift card to a local restaurant supporter of the film series. The event is free and open to the public. For questions, contact Scott Sigel, assistant professor of foreign language, at scott.sigel@minotstateu.edu. Efrain Amaya, assistant professor of music, will direct the Minot Symphony Orchestra in “Scandinavian Soundscapes,” the Norsk Hostfest concert, Sept. 27 in Ann Nicole Nelson Hall at 7:30 p.m.
Norwegian tenors Didrik and Emil Solli-Tangen, Norsk Hostfest performers, will join the orchestra. Didrik is an educated classical singer from the Barratt Due Institute of Music, and Emil received his training at Oslo’s National Opera Academy. Ticket prices are $25 main floor and $30 balcony. For more information about MSO, visit www.MinotStateU.edu/symphony/. Trinity Health, Minot State University, and Dakota College at Bottineau embarked Aug. 31 on a five-year collaboration to assist in meeting the health care needs of the region and create more opportunities for students to receive a nursing education in the community. Trinity Health committed to donating $1.25 million to Minot State University’s Department of Nursing and $500,000 to Dakota College at Bottineau’s nursing programs over the next five years. The initiative, “Nursing for the Future,” aims at ensuring both institutions will continue to admit, prepare and graduate high-quality nurses. And, in turn, provide Trinity Health with a robust pool of graduates to recruit from. To read the full news release, go to http://www.MinotStateU.edu/pio/news/2016/08/trinity-health,-msu--dcb-announce-nursing-for-the-future-initiative.shtml. Sept. 14-24 — NOTSTOCK artists, printmakers Dan McCarthy of Boston and Neal Williams of Eugene, Ore., display stunning detailed screen prints of nature and other subject matter, as well as posters for bands and movies, Library Gallery. Sept. 14-30 — Americas 2016: All Media features traditional and experimental works of any medium and juried by Kim Fink, UND, professor of art and printmaking, Hartnett Gallery. Brent Askvig, Rhonda Weathers and Amy Armstrong from the North Dakota Center for Persons with Disabilities, along with Cindy Kile and Sheryl Beard from NDCPD's Consumer Advisory Council, participated in the Legislative Training Institute Aug. 29-31 in Bismarck. The institute prepares service providers, people with disabilities and their families to participate actively in the North Dakota legislative process. Deanna Klein, Department of Business Administration chair and business information technology professor, will receive the Ben Bauman Award of Excellence at the IACIS Conference in Nashville, Tenn., in October. Roxi Mathis, artist and catalog assistant in the Gordon B. Olson Library, has an exhibit, “Little Beast and Far Away Skies,” on display at Bismarck Art and Galleries Association through Sept. 24. Troy Roness, instructor of teacher education and human performance, will have his book, “Broken: Discovering Truth within the Pieces,” published in late September with Moguly Media. Tom Seymour, retired professor of business information technology, was awarded the designation of professor emeritus by Minot State University President Steven Shirley Sept. 9.